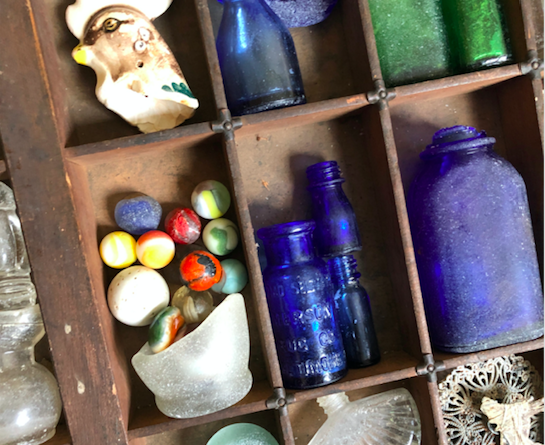 Time has flown by as I have been spending it getting ready to open the “Beach Finds of the Chesapeake Bay” exhibit at the Chesapeake Bay Maritime Museum, premiering at the Eastern Shore Sea Glass Festival. I am opening this exhibit in my capacity as Executive Director of The Sea Glass Center educational non profit and it also works in conjunction with my role as Education Chair of the North American Sea Glass Association. On Friday evening April 5 there will be a premiere event to launch the exhibit (the event sold out right away), and then Saturday and Sunday April 6-7 I will be at the St. Michaels festival all day with the exhibit, which features hundreds of items, from Miocene era shark teeth and fossils to arrowheads and the private beachcombing collection of Chesapeake Bay waterwoman Elaine Crow who has worked on the water for 50 years- her beach-found Victorian porcelain dolls, German handmade marbles, and other collectibles are stunning. Parts of my own collection from kayaking on the Chesapeake for the last 20 years will also be on exhibit along with photographs, and I will have sea glass and other items for sale. I will also be dong sea glass identification all weekend and judging the sea glass contest on Sunday. Hope to see you at the Eastern Shore Sea Glass festival for the launch of the Beach Finds of the Chesapeake exhibit! It has been a treat to meet other beachcombers of the Chesapeake and I am grateful to them for lending parts of their collections for the public to enjoy. Look forward to seeing friends old and new.